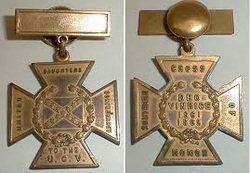 The Cross of Military Service is awarded by the United Daughters of the Confederacy to veterans who are direct descendants of a a faithful Confederate veteran. There are four in number and are the outgrowth of the Cross of Honor. They are: the World War I Cross of Military Service ( retired August 31, 2011), World War II Cross of Military Service, the Korean War Cross of Military Service and the Vietnam Conflict Cross of Military Service. These decorations have been established as a testimonial to the patriotic devotion of worthy Confederate Soldiers or Sailors and their descendants. The medal in the shape of the Maltese Crossed used on the Southern Cross of Honor, is presented to veterans of World War I, World War II, the Korean War and the Vietnam Conflict. This is the most prestigious award presented by the United Daughters of the Confederacy and was established as a testimonial to the patriotic devotion of the descendants of Confederate Veterans. Foreground: A Crusader Cross in bold relief, each bound to the other by the Battle Flag of the Confederacy and linked by the entwined monogram, UDC, to ribbon. It is attached to a laurel leaf as a special mark of valor for those who distinguished themselves in feats of courage. The color of the ribbon signifies the War of Conflict in which the recipient served. World War II Cross of Military Service is for service between 8 December 1941 and 31 December 1946. Korean War Cross of Military Service is for service between 27 June 1950 and 11 November 1955, in Korean or on land / in airspace / in waters contiguous to Korea. If you have a relative whom you believe qualifies, contact us. Paul Harold Kirby - Expeditionary Service Medal and National Defense Medal. Presented at 2013 Division Convention. Syble Davis Owens on behalf of her father John Levi Owens: World War I Cross of Military Service. Evelyn Stills on behalf of her ancestor Matthew James Harrison: World War I Cross of Military Service. Michelle Kirby on behalf of her Great Uncle Lee Jackson McMillan: World War I Cross of Military Service. A new Cross of Military Service for the Global War on Terror (GWOT) was approved at the 118th Annual General Convention in Fort Worth, Texas. Due to the unusual way the GWOT went from an Expedition to Conflict, veterans who have already received the UDC Expeditionary Service Medal for the Global War on Terror (GWOT) may also be eligible for the Cross of Military Service for the Global War on Terror should Chapters wish to pursue it. These veterans will be authorized to wear both. The reason is that the Department of Defense (DOD) originally considered Iraq and Afghanistan to be an Expedition, but as the conflict continued to rage, by April 2005 it was acknowledged to be a full-fledged conflict and the Armed Forces ceased authorizing the Expeditionary Service Medal for Iraq and Afghanistan and instead authorized only the Global War on Terrorism Service Medal (GWOT-S) and campaign medals for Iraq and Afghanistan. The Expeditionary and GWOT-S overlapped for several years so we believe that UDC should do the same. However, not everyone who was awarded a UDC Expeditionary Service Medal will be eligible for the Cross. He/she must have served in Iraq or Afghanistan or contiguous waters and have been awarded campaign medals as well as the GWOT-S. If you have questions, please contact your Division Recorder. The Pioneer in Space Award is presented to men and women who are lineal blood descendants of Confederate military personnel and who have flown in space. National Defense Medal is presented to veterans who are direct descendants of a faithful Confederate veteran and who served in the Korean War (27 June 1950 to 11 November 1955) or the Vietnam Conflict (1 January 1961 to 14 August 1974) but not in country / on land / in airspace / in waters contiguous thereto or in the Persian Gulf War (2 August 1990 to 30 November 1995).Description: The bronze medal features a seated Liberty flanked by the Flag of the United States of America and the First National Flag of the Confederacy and framed by laurel leaves. The medal is suspended from the official red and white ribbon by the intertwined initials, UDC. The Armed Forces Expeditionary Medal is presented to veterans who are lineal blood descendants of Confederate military personnel and who served a minimum of 90 days active-duty in the U.S. Armed Forces with service of at least 30 days in U.S. Military Operations, U.S. Military Operations in Direct Support of United Nations, or U.S. Operations of Assistance for Friendly Foreign Nations after July 1, 1958. The Meritorious Service Award is presented to veterans who are collateral descendants of Confederate military personnel and who have given military service to our country in certain time-frames. We offer several military service awards to those men and women who are documented descendants of those who honorably served or gave Material Aid to the Confederacy. This tradition began with the first medal, the Southern Cross of Honor. History: The Southern Cross of Honor was a medal created by the United Daughters of the Confederacy presented to Confederate veterans following the war. The original name was “The Southern Cross of the Legion of Honor.” The design selected was the Maltese Cross with a Confederate Battle Flag on the face surrounded by a wreath of laurel and the inscription, “The Southern Cross of Honor, 1865, Deo Vindice” (God our Vindicator). The idea of bestowing this Cross was conceived by Mrs. Mary Ann Lamar Cobb in 1898 during a reunion of the Confederate Veterans in Atlanta. As a compliment to her in bringing forth this custom, the first Southern Cross of Honor was conferred upon her husband, Captain and Judge Alexander S. Erwin. 78,761 crosses were bestowed until 1913. These were recorded in a ledger kept at UDC’s National Headquarters in Richmond, VA. Those ledger entries have been microfilmed and cross referenced. Since that time, additional Confederate veterans have been honored posthumously. Anyone wishing to confirm an ancestor received the Southern Cross of Honor may contact us to submit a request. The United Daughters of the Confederacy continued the tradition of recognizing all veterans through the Military Service Award program. Found! Advance to 2:34 to see how this was found.